Islam and women is a very controversial topic and can be analyzed from many different perspectives. It is the topic I chose with the hope of trying to convey a simple message through my art project. Because of my basic skills in art as it is not my area of study, I chose to use the collage method as it was easy for me to do and at the same time encouraged me to think creatively when trying to use the right images for my project. Using the art collage from Arabic magazines, I began to be inspired by the amount of Muslim Middle Eastern entrepreneurs that I came across. Therefore I chose a few of them who were all Muslims yet some covered whilst other weren’t in order to stress that Muslim women don’t necessarily all look the same and they are becoming more and more important in the fashion industry. There is a typical stereotype that Muslim women are oppressed and hence never get to follow their dreams and that the fashion industry in particular is “haram”. With just a little research on the new coming Muslim women and designers/bloggers we can see that this is in fact not true. Muslim women both covered and non covered are entering the fashion world with fresh ideas that are grabbing much attention. The pictures I added to my collage were chosen selectively as I wanted to portray successful Muslim woman who have made it in the fashion world yet also I wanted to show the contrast of they were they dress. For example, a few of the pictures were of Muslim women who wore a headscarf. Then to contrast it, there were women uncovered wearing very fashionable clothes. Also I wanted to show the new alternatives to the “hijab” now as the turban is becoming more popular and therefore I added an image of a Muslim lady looking extremely fashionable yet modest with a turban hijab. All of these women are available on social media as well and have a platform of fans, also breaking the stereotype that Muslim women can’t be exposed to the world in such a way. It also breaks the stereotype that Mulsim women are restricted to their homes and their duty not exceeding that of her husband and kids. This is becoming increasingly false as religion is no longer a reason as to why women can’t follow their dreams, not making it less important however it is something personal. It was also interesting to see one of the Emarati designers design dresses and very fashionable clothes for her line that targets the elderly generation. This was even a surprise to myself as I would have thought being an Emarati and completely covered she would lean towards designing abaya’s however I was proven wrong. This also shows that covering oneself is something personal and does not have to affect your ideas or work you wish to produce. Fashion designers are also collaborating with one another with one of them covered whilst the other isn’t and it does not in any way affect their relationship or how they deal with each other. 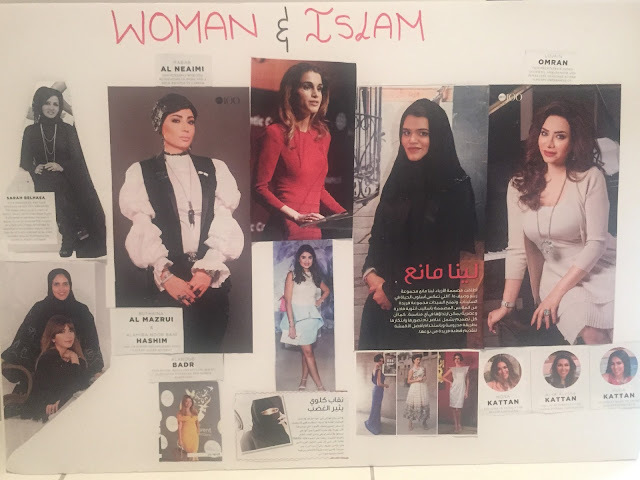 In conclusion, what I wanted to stress in my project in the topic art and Islam is that Muslim women do not all look the same and they do not all aspire to be the same. Like everyone else they dress differently and similarly have different goals. Religion will always be close to the hearts of Muslim ladies however in an increasingly globalized world they are able to keep their religion as something close to their heart and not let it stop them from achieving their goals. Whether a Muslim lady wears hijab, a turban or even a short dress it does not affect their work ethic and their endless ability to achieve. In fact they work together in harmony and unlike what many think, they are not oppressed and are able to express their creativity in their work.